State-of-the-art venue becomes first new stadium construction project to choose LED lighting. The Vikings stadium mission to create a unique structure optimized by design as environmentally friendly with energy-efficient operations is enhanced by installing LED light. Ephesus LED emits a substantially improved illumination while requiring 75% less energy when compared to the operation of traditional metal halide lights in stadiums over the past 30 years. The LED are manufactured by Cree. According to Mike Lorenz, President of the Syracuse-based company, and Mark Wilf, Owner/President of the Vikings, the facility becomes the first new stadium to announce construction with LED. 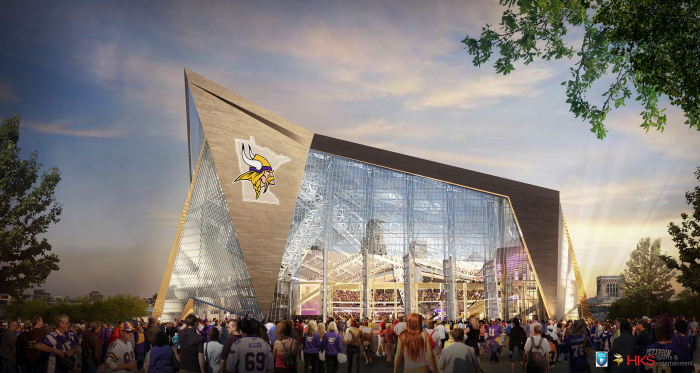 The Minnesota Sports Facilities Authority (MSFA) is owner and operator of this gargantuan construction endeavor with a capacity for 72,000 fans. Other events to be hosted by the building include, Super Bowl LII (2018), a NCAA Final Four in 2019 and a possible MLS expansion team. “In addition to the high-quality lighting this partnership will provide for all of our events, the energy efficiency of these LED lights will provide significant savings to the Authority every year,” said MSFA Chair Michele Kelm-Helgen. Vikings fans, broadcasters and sponsors will be happy about the upgrade to a more natural lighting effect. LED provides a brighter source that covers more of the field, resulting in more uniform and even disbursement of light. Players can see better because of LED while fans can watch athletes in-stadium or on their HD televisions and mobile devices with more clarity. A new Ephesus color tuning technology will enhance the fan experience because it, “will allow the system to adjust the light output to match the activity being seen to create even more engaging experience for fan entertainment without adding new fixtures,” said Joe Casper, Chief Technology Officer. LED technology was first implemented in North America by Ephesus Lighting in 2012. They have since shined over 300,000 hours across 100 indoor and outdoor sports and entertainment venues. Besides the University of Phoenix Stadium home of the NFL’s Arizona Cardinals, The Canadian Tire Centre, home ice of the NHL’s Ottawa Senators are also users. Ephesus is the only stadium-designed lighting system listed under Design Light Consortium’s (DLC) quality, performance and energy efficiency requirements. The DLC certification enables facilities to receive energy incentives from utility providers. 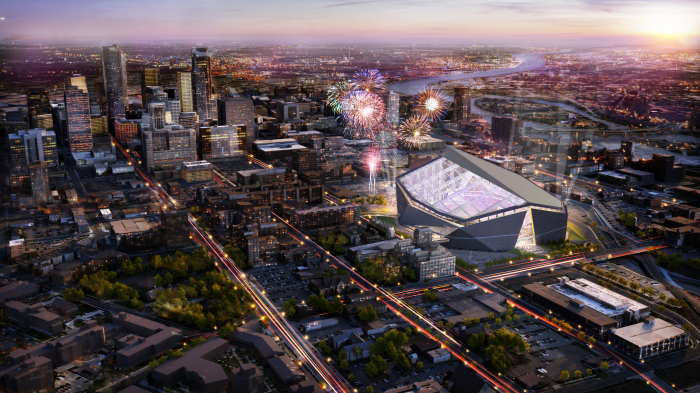 Scheduled to open in July, 2016, the stadium will have the largest transparent ethylene-tetraflouroethylene (ETFE) roof and five pivoting glass doors as tall as 95 feet that will open to a nearly three-acre plaza and the Minneapolis downtown skyline. The transparent ETFE roof and the nearly 200,000 square feet of glass throughout the building will give fans an outdoor feel in a climate-controlled environment. 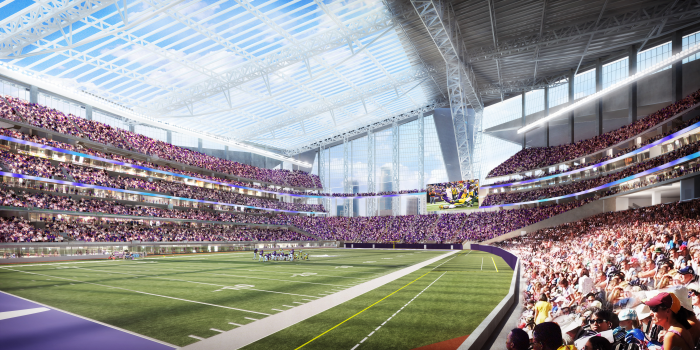 Vikings fans will also be as close to the action as any NFL stadium, with seats just 41 feet from the sideline. Two of the largest and highest-quality HD video boards in the NFL will be located in both the east and west end zones, and 2,400 HD flat screen televisions will be distributed throughout the stadium. The multi-purpose stadium will be publicly-owned and operated by the MSFA. Ephesus Lighting, Inc. is a US-based company that manufactures high-output LED lighting solutions for challenging applications in the industrial and sporting markets. Ephesus is focused on innovating advanced LED solutions that will enrich and illuminate the world, by creating brighter, more vibrant and more sustainable environments. Sports Techie, If all 32 NFL teams went LED, think of all the power saved. Two franchise are a start. 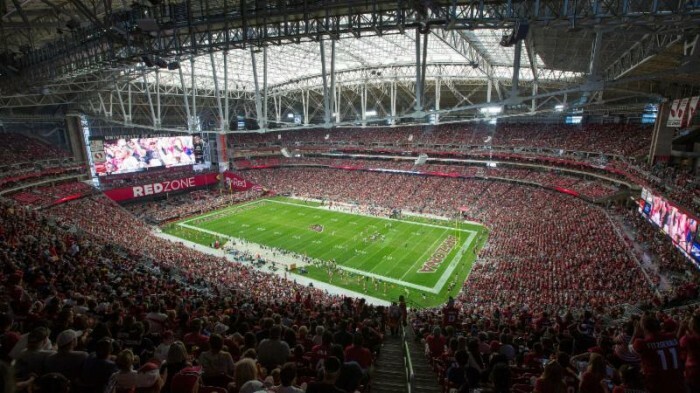 Super Bowl XLIX should be shining examples of the value of LED to the other 30 NFL teams and what fans can expect in Minneapolis. Another bright spot concerns area birds. Not only did new Vikings Stadium use the brightest LED on the market helping birds to see better that are trying to fly through the transparent ETFE roof and five glass doors nearly 100 feet tall, but a possible $60 million construction cost add-on of fritted glass is now on table for the MSFA to vote on. Bravo to the ongoing LED movement at sports and entertainment venues. Now bring on the Super Bowl and go Hawks.